SteemPress is a relatively new WordPress plugin that connects your WordPress blog to the Steem blockchain. What does that even mean? Here’s a short review of it. If you’re not familiar with cryptocurrency, you probably won’t understand what a blockchain is, let alone the Steem blockchain. A good definition on what a blockchain is can be seen in this Coindesk article. Basically, the Steem blockchain is just one of the blockchains available in the industry. It was created by Ned and Dan, with Steemit as its first decentralized application (DApp). The Steem blockchain is known for its 3-second transaction speed, zero fees and scalability. As far as SteemPress is concerned, what you should know is that you can earn Steem and Steem Dollars on the Steem blockchain. Both Steem and Steem Dollars can be traded for other cryptocurrency or for fiat money. Why the need for SteemPress? Many bloggers and content creators on WordPress do not earn enough from their blog. Some do not even know how to do so. As there are plenty of bloggers earning only enough to cover their hosting costs, SteemPress might be a great solution. It allows you to earn from your articles by re-publishing it on the Steem blockchain. This means you’ll be able to see your articles on Steemit, and earn from it within a 7-day time frame. To clarify, you earn Steem and Steem Dollars via upvotes from other users, the amount depending on the Steem Power a user has. If the concepts of Steem, Steem Dollars and Steem Power gets confusing, do read this article on understanding the Steem blockchain. In a nutshell, SteemPress allows bloggers who may not be earning enough from their blog to monetize their articles on Steem. This gives them at least a side income from their articles. It’s actually really simple. Just download the plugin SteemPress and activate it. Once activated, go to the settings page and you’ll see the screenshot above. Key in your Steem username and private posting key. It allows SteemPress to publish the article for you. Also, you can set the rewards to either 50% Steem Power and 50% Steem Dollars or 100% Steem Power. I personally prefer the former option. 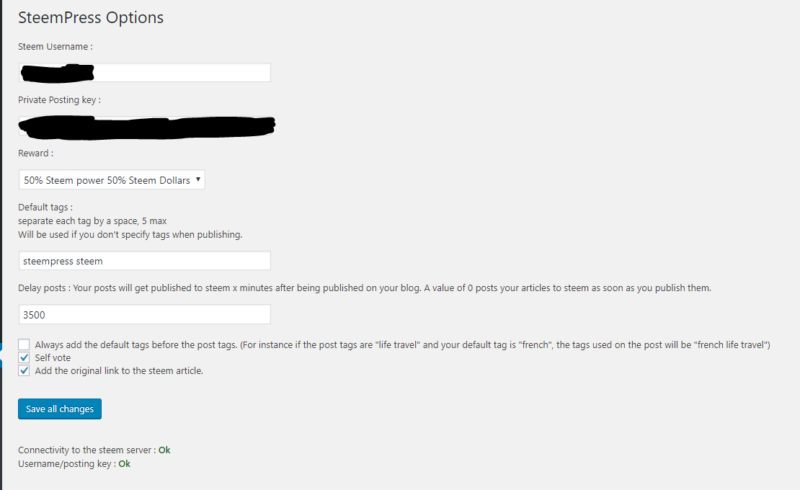 Next, you can also choose to delay the publishing of the article to Steem (in minutes). Also, tick the boxes that suits you the most. That’s it. It’s really easy to configure and earn extra money from the Steem blockchain. This screenshot was taken of another Steemit user (@shadowspub). With SteemPress re-publishing your content, it would mean there will be duplicate content on the search engines. Doesn’t that mean it’s bad for your blog’s SEO? Well, it’s always a risk and you’ll have to experiment with it to see if Steemit outranks you. It’s recommended to set a delay before posting, at least a few days or a week. Assuming you blog daily or regularly on a consistent basis, Google should crawl your articles in a shorter time span. So if you have a delay before re-publishing your article, Google should know that your article is the original one. Having said that, I’m not sure myself if your article will be outranked by Steemit (as Steemit has a high domain ranking). If you don’t really mind, then it’s no issue at all since you can earn from Steem. As for myself, I’m more cautious since I want my blog to do better. I’ll monitor closely on this. SteemPress is quite a new plugin that aims to change or supplement content creators on WordPress blogs. It’s indeed a novel creation and deserves recognition by the WordPress community. As many bloggers struggle to earn from their blogs, SteemPress may even be life changing.